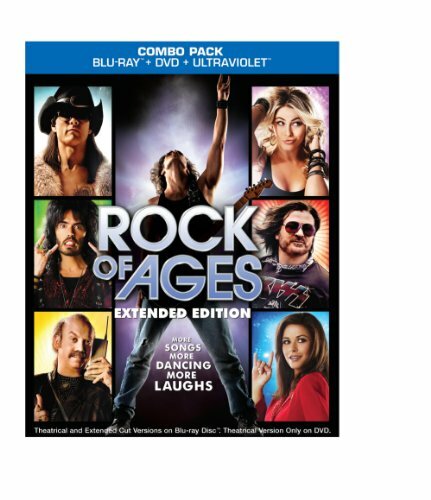 Burbank, CA, August 27, 2012 - It will be nothin' but a good time when Rock of Ages arrives onto Blu-ray Combo Pack, DVD and Digital Download on October 9 from Warner Home Entertainment Group. Based on the hit Broadway musical and featuring the heart-pounding hits of Def Leppard, Foreigner, Journey, Poison, REO Speedwagon, Twisted Sister and more, Rock of Ages is a love story that celebrates big dreams and loud drums. The Blu-ray Combo Pack features the extended edition, with over 13 additional minutes of more songs, more dancing and more laughs. * Rock of Ages: Legends of the Sunset Strip Hosted by Bret Michaels - Hear from rock stars - Def leppard, Poison, Whitesnake, Foreigner, Twisted Sister, and more - as they relive the music and vibe of the extroadinary Sunset Strip. * The Stories We Sing - Find out the real stories and crazy events that inspired your favorite power ballad's and rock anthems of the 80's. * Defining a Decade - Join Julianne Hough, Diego Boneta, Russell Brand, Tom Cruise, Mary J. Blidge, Catherine Zeta-Jones, director Adam Shankman and others to show us inside the world of the late 80's! * If You Build It, They Will Rock It - Defining A Decade - A look at the historical significance of the real "Sunset Strip" clubs in the 80's and how they shaped the design of the Bourbon Room in the movie. On October 9, Rock of Ages will be available for download from online digital retailers including iTunes, Xbox, PlayStation, Amazon, Vudu and CinemaNow. The film is also available digitally starting October 9 in High Definition (HD) VOD and Standard Definition (SD) VOD from cable and satellite providers, and on select gaming consoles. *UltraViolet allows you to collect, watch and share movies and TV shows in a whole new way. Available with the purchase of specially marked Blu-ray discs, DVDs and Digital Downloads, UltraViolet lets you create a digital collection of movies and TV shows. Services such as Flixster and VUDU allow you to instantly stream and download UltraViolet content across a wide range of devices including computers and compatible tablets, smartphones, game consoles, Internet-connected TVs and Blu-ray players. Restrictions and limitations apply. Go to ultraviolet.flixster.com/info for details. Learn about VUDU compatible devices at vudu.com. A division of Warner Bros. Entertainment Group with operations in 90 international territories, Warner Home Video, a Warner Bros. Entertainment Company, commands the largest distribution infrastructure in the global video marketplace. Warner Home Video's film library is the largest of any studio, offering top quality new and vintage titles from the repertoires of Warner Bros. Pictures, Turner Entertainment, Castle Rock Entertainment, Village Roadshow, HBO Home Video, and New Line Home Entertainment.